Walking up stairs is an effective way to burn calories. You've tried the so-called "miracle products" featured on late-night infomercials to no avail -- your belly fat still rears its ugly head every time you notice yourself in the mirror. Don't give up just yet -- it's time to break a sweat, burn a few calories and get yourself in tip-top shape. 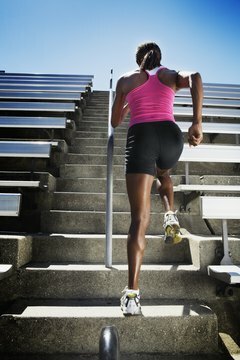 Forget about the latest exercise gimmicks and focus on a simple, effective way of burning fat -- walking up the stairs. If your mind has been slightly warped by the too-good-to-be-true claims made on weight-loss infomercials, you're not alone. Many people believe that by targeting one part of their body through exercise, they'll burn the fat in this area. This concept, called "spot reduction," is a weight-loss myth. While you'll burn the muscles of the part of your body that you target, you can't target fat loss. Only upon losing fat throughout your body will you see less fat in the area in question. 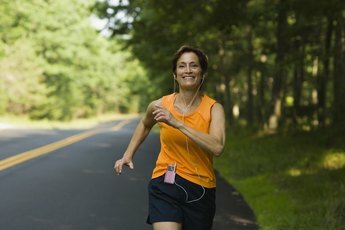 Aerobic exercise is a way for people to burn calories to help lose fat throughout their body, including around their belly. Aerobic exercise takes many forms, including jogging and cycling, and walking up the stairs is an effective way to burn calories quickly. MayoClinic.com reports that the action of walking up the stairs helps someone who weighs 160 pounds burn 657 calories in an hour. This amount is more than such activities as high-impact aerobics, hiking and ice skating. If you want to add a stair-based exercise to your workout regimen, the process is simple. To incorporate this activity in your everyday life, climb the stairs instead of using the elevator at your apartment building or office. To devote more time to stair climbing, find an empty stadium in your community and walk or run up and down the stairs as part of your everyday workout. 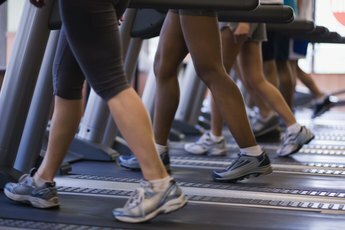 If you have a gym membership, check to see if the gym has a stair climber, which simulates the act of walking up the stairs. Combining exercise and a healthy diet is a sensible way to lose belly fat and fat in other areas. Because a pound of fat is equal to 3,500 calories, you must burn 3,500 calories beyond what you consume to lose a pound. Although your recommended daily caloric intake depends on your age and how active you are, women should typically consume between 1,800 and 2,400 calories each day. By limiting your calories to this range and exercising, weight loss is possible. 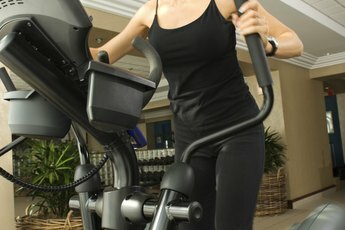 Does Walking Tighten the Inner Thighs?